For big or small projects that create a lot of debris renting a dumpster is a smart alternative. Having a dumpster on site can save lots of time and fuel because you will not need to make repeated trips to the local landfill and other disposal facilities. Dumpsters can accommodate larger items that many other receptacles can’t and will safely contain potentially dangerous items, such as wooden boards with nails protruding or pieces of metal with sharp edges. With their high, sturdy sides, dumpsters can keep children and other curious passersby out, helping you safely dispose of your debris. To seal the deal one of the first things you will want to know about renting a dumpster is cost. Let’s go through the basics of dumpster rental prices. Dumpster rental companies will have different base prices for their dumpster sizes. Our dumpsters are measured in cubic yards, from a 6-yard dumpster to a 40-yard dumpster. If you are looking for cheap roll-off dumpster prices, smaller volumes and lighter weights will typically be the way to go. Naturally, you can expect to pay more as you go up in scale from smaller volumes to larger volumes. So the first thing you need to do is decide how big a dumpster you need for your project. Visit our dumpster size guide for help determining which size is best for you — it will help you visualize how big each dumpster is and give you examples of common projects for which each size is used. Tonnage Included - Amount of waste you can put in the dumpster without incurring an extra charge. Some roll-off companies will offer more tonnage at a reduced rate if their dumpster is being filled with clean fill: strictly dirt and/or concrete. Check out our Concrete Dumpster Rental page for more help identifying if your debris will fall into this category. It's also never a problem if you need the dumpster for longer than the included rental period. Simply log into your Dumpster Market account with the email/password you provided at checkout and you can “request an extension” from your dashboard. If you do this a couple of days in advance, your provider will usually be able to accommodate your desired pick-up time. If you do not request an extension through our website or by calling us prior to your scheduled pickup date your hauling company will show up on the scheduled date. Need help determining the right dumpster for your project? Call 1-844-728-3533 and we'll be happy to lend our honest opinion. 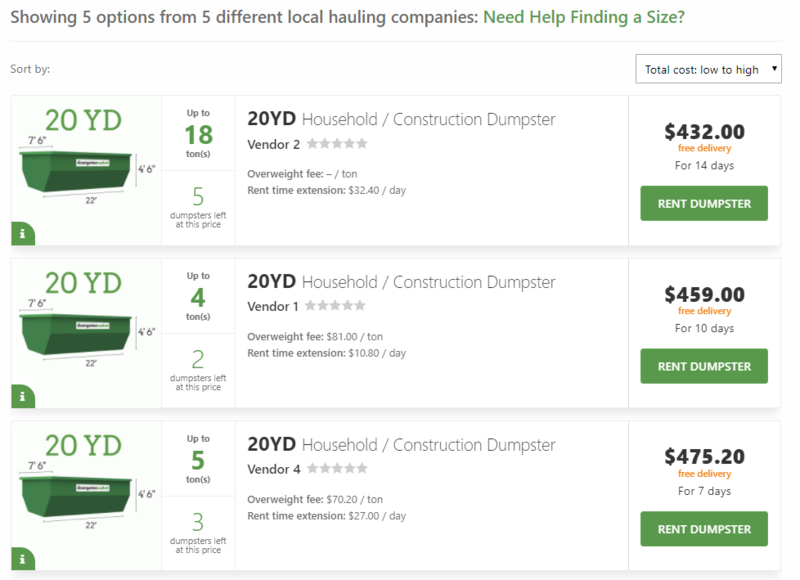 The beauty of using Dumpster Market is that you get to see all of the available dumpsters in your area and compare not just base price, but all the variables listed above. It works like shopping for a flight with kayak.com or expedia.com. When you put your zip code in and search you see the available list of prices/sizes. *“Vendor 1, Vendor 2, Vendor 3, et…” are all different local hauling companies with different price offerings. *They remain anonymous until you have booked your dumpster rental with them. At this point you are put in direct phone/email contact with the person coordinating your rental. Filter and sort your options so that you can find the option that is truly the best value for you. In the example to your right, you can see someone who has sorted the 20 yard dumpsters available for their desired address by base price from lowest to highest. There’s nowhere else on the internet that lets you search for the availability of a dumpster rental and instantly see price offerings from multiple local hauling companies in your area. Don’t throw money away when you rent a Dumpster. Our solution is intended to help you easily identify the best deal on a dumpster rental in your area that fits your needs. No surprises throughout the process, no hidden fees, no hugely inflated pricing. Here’s an example to help understand how you save money with Dumpster Market. - You will likely have 3.5 tons of construction waste to dispose of. - You will need the dumpster for around two weeks. Dumpster Market gives you quick visibility to these highly variable costs associated with a dumpster rental. 1) Identify all of the roll off dumpster rental companies that service the location of your project. 2) Call them and get quotes (for their base price, tons included, overweight fee, days included, extra day fee…). 3) Sort through all of the info you have collected manually to compare your options. 4) Once you’ve done all of this you’re prepared to make a decision on who you think is giving you the best deal. *Dumpster Market’s experienced representatives help you identify your best option and you can rest assured that you have found the best value on your dumpster rental. Dumpster Market is the simple and complete online solution for all things dumpster rental. There is nowhere else where you can compare the dumpster prices offered by your local providers, and rent a dumpster with just a few clicks. No phone calls needed!